Failure in life is something which everyone should accept and realize in life. Everyone is prone to make mistakes and there are ways to recover from the same and carry on with the usual style of life. Career catastrophe is challenging and recovering from it is mandatory. Strong emotions are developed when tragedy in career happens and hence getting released from such disaster is necessary. The phase of education in life can be gifted and people desire their work place to be enjoyable. In hindsight they must have realized certain aspects which they would have not researched earlier. Whatever may be the fact, let’s dive through few aspects that help one recover from career disaster. When there may be some misadventure occurred in your career, make sure to accept the blame rather than shifting it or offering excuses for the trouble. Take a deep look at the situation. It would be enticing for you to escape from the situation by pointing out others, get away from the scenario, and also desire that you aren’t revealed. All these thinking will only step up your situation and enhance your trouble. So it is best to face the problem rather than hiding from the truth. Based on the scenario, an apology can be a powerful statement and a solution to diffuse situation. One bad decision can make guggle effect and bring about a number of damaging outcomes which have chances to distress people, organization and projects as a whole. A sorry can be an allayer for that situation, but assessing the situation and finding out what can be done is necessary. Taking action for the disaster occurred and revamping the damage is necessary. Demonstrate others that you’re willing to work and cleanse your damage, if you aren’t sure of what action needs to be taken, seek advice from advisors and carry on. There is none who is interested to hear your explanation and your excuses for what has happened. Explain your aim and route towards destination the happenings that took place. Give a clear reason for why such a thing has happened. Also make sure to open up that you weren’t delinquent in your duties. All these explanations will assure others that you possess good intentions, and you also take up the scenario and learn from it. It could be any kind of disaster or dismissal that has occurred in your career, make sure as you would be asked for awkward questions. It is necessary for one to remember to answer in a positive and honest manner. Taking a dive in your speech regarding yourself or your organization should be averted. At times of career catastrophe it seems that your self-esteem is blown away. It is significant for employees to fight the battle of emotions and get back their confidence and participate in the game. It was said by Randall that certain research indicates that the motivating fact for any employee at work place is his reputation, optimistic feedback, and aspects that boost his self-esteem rather than money. So when self-esteem is targeted and broken it hurts more. 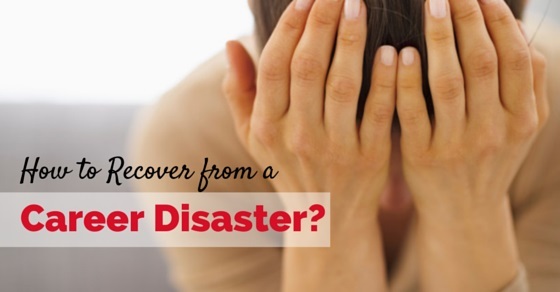 Another vital aspect to be focused on is to stay positive when a career disaster takes place. You should survey and make out that you’re affected with some issues and so take initiatives and wok in an optimistic way to demonstrate better performance. A career disaster brings in a lot of bumps and shocks and also makes sure to jiggle your confidence in a terrific manner. Experiencing such difficulties in your career is just a recovery from hurts. Rehabilitation is the key tool which is required by any employee after career disaster. The only thing to be achieved here is changing over some frames and gaining attitudes. It is good to learn to get attitude and start learning. If decided to fight the battle and sit on the right track, make sure to seek the help of friends and other colleagues as friends and acquaintances take up the main responsibility in providing support and advice. During the recovery process, it is your caring ones who help you gain perspective. Supportive relationship who can encourage you and cheer you are ones you need to concentrate on. A failure allows an individual to indulge in pity parties and degenerating another part of life. Concentrating on health in such situations is suggested. A clear example is that a guy with the same career disaster lost $3.2 billion for the same reason above, where he was advised to go to gym every day in the morning. By this way he was delivered with physical stamina and energy and he was able to recover from career disaster soon. And hence maintaining good health is mandatory to get back to normal from career disaster. There surely must have been a misstep for any professional in his career. Right from Steve jobs to Jennifer Lopez must have faced career failing situations. But now all those failures must have disappeared as successes have invaded the same position. At times you face a career disaster try to speak to ones who can offer you with positive wisdom. When you hear their career disasters and stories about how they climbed the tough ladder in career, it boosts energy in you and also makes you walk with wisdom. Do you know the best part of any work place disaster? It is nothing but educating from the same. Every stumble has something to learn from for future. The best solution would be to avert form the similar mistakes taking place again and listen to the examples. It is always good to learn from such disasters about how future disasters can be destroyed. When you define what you learned your higher officials would apprise and get to know that you’re learning from your blunders. Once everything is set up right, make sure that the issue is resolved. Also remember to implement the lesson learned in future happenings. Take chances and move on instead of dwelling on the same disaster. With the gossip about career disaster sure for any individual, it is also to be mentioned that career disaster can be avoided by following certain strategies in life. Whether its work place or any other situation right pre-planning for the task provided ability to complete the task, passion for the work and keeping you update with the recent work is important. All these agenda can help you avert and get away from work place disaster. Another few aspects included to avoid career disaster are to avoid jumping into new careers which is irrelevant to your basics. An engaging job where you enjoy every step is one way to avert disaster. Loving your present job and working with passion is another method where you can regain from disaster that happened. A career disaster can happen when a professional is not updated about his industry and lacks knowledge about the happenings. So it is vital to make some research and keep yourself updated. Try to invest in the right training program in case skill training is required for an individual. In the same manner for any scenario change cannot take place instantly, it takes some time for change to happen and hence overnight affairs aren’t a solution for career disaster. People believe that success is measured with money, power and fame, but this is a fake statement which may lead to career disaster quickly. Those metrics are right but focusing on success can be the only key tool to avert and recover from career disaster. Define success as your goal and aim and run behind it in order to battle career disaster. Career disaster can be a cataclysmic fall from a reputed position, but this painful experience teaches you a lot. By facing such career disasters one is sure to make a perfect balance of life in future. The tips mentioned above can be followed in order to overcome and face career disasters that happen in life. There are a number of great people who turned career disaster into successes, reading their posts can help you manage yours. A few successful people who faced career disasters are Donald Trump who was the CEO and chairman of Trump organization, An American business magnate called Martha Stewart, Bernie Marcus and Arthur Blank, George Foreman from Boxer to entrepreneur, and J.K.Rowling. Professionals or employees can run through these points and also read in detail about these famed personalities to know their recuperating from career disaster. Previous articleIntroverts at Work – How to Work with Introverts in the Office?